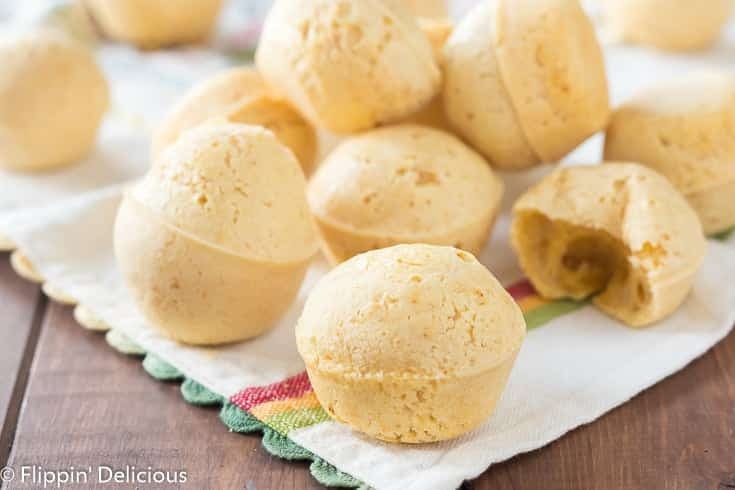 This dairy free Pão de Queijo recipe is SO easy! 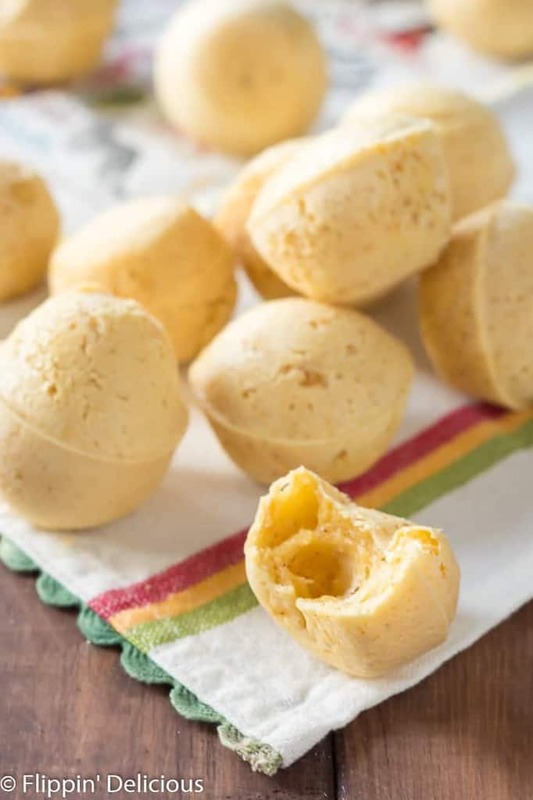 Also known as Brazilian Cheese Bread, or Brazi Bites, they are naturally gluten-free and grain free because they are made with tapioca flour! This recipe is super simple. Add all the ingredients to your blender in order, and then blend until smooth. It takes less than 5 minutes! Pour the batter into a greased mini-muffin tin and bake it until the un-cheesy breads puff up and are golden. There is a delicate crisp crust, with a chewy inside. This recipe is also more budget friendly than traditional Brazilian cheese bread because cheese is the most expensive ingredient in them! I do want to note, tapioca flour is different from the cassava flour all the paleo bloggers are using (even though tapioca is cassava). This recipe won’t work with cassava flour! The tapioca flour is labeled interchangeably as tapioca starch, and often has both tapioca flour and tapioca starch on the package. I’ve used Bob’s Red Mill Tapioca Starch, and also tapioca flour from my local international food store (it is in the Asian section, by the rice flours). 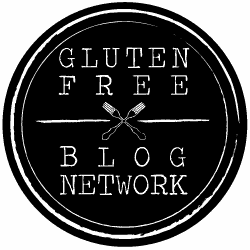 If you have celiac, or are making this recipe for someone who is, be wary of using the flour from your international store since it is difficult to track it’s processing and packaging to ensure it it truly gluten-free. My good friend Kristi first introduced me to Brazilian cheese breads. She is the kind of person who randomly stops by unannounced with a plate of monster cookies or a bag of homemade caramel popcorn (I love that about her). When I was first married and started eating gluten-free, she started looking for goodies she could share with me. Kristi is my favorite kind of person. I try to be the person who pops over with warm giant gluten free chocolate chip cookies in hand, just like her. I’m eternally indebted to Kristi for introducing me to Pão de Queijo. It was a recipe that she often made for her family because her husband had lived in Brazil for a while, and since it was made with tapioca flour and was naturally gluten free, she could share it with me too! About two years ago my toddler started having problems with dairy. About the same time my family went dairy-free, we started having regular Sunday dinners with Kristi’s family. My sister’s family would often come too. Some Sundays we’d have eighteen people or more! 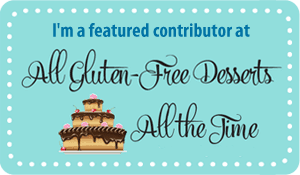 I’d usually bring dessert, since it is the trickiest thing to make gluten free and dairy free. Gluten Free Vegan Chocolate Pie was one of my go-to desserts, everyone loved it! Kristi would make a Brazilian-inspired meal of beans and rice, topped with bacon and fresh tomatoes. It was an easy and budget-friendly way to feed our entire crowd. It may sound simple, but Kristi makes the best beans and rice I’ve ever had! She would also make a big batch of Pão de Queijo. 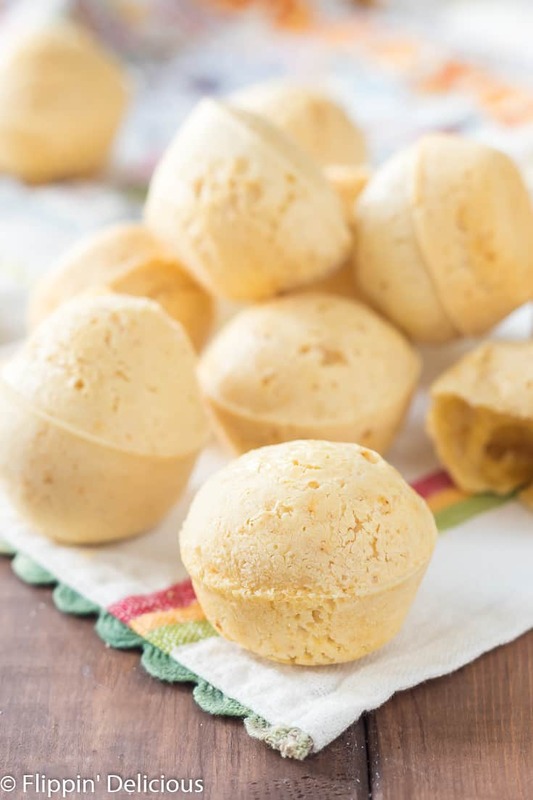 Over the past year, I’ve worked on perfecting my dairy free Brazilian cheese breads recipe, so that my daughter could enjoy some Pão de Queijo too. 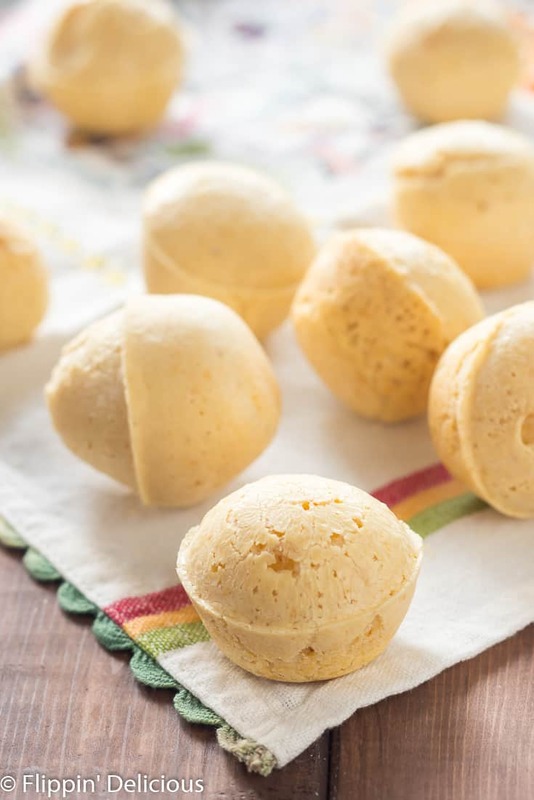 Now when we gather for Sunday dinner, I’ll make a big batch of dairy free Pão de Queijo. I can never make enough! It always disappears quickly, with someone fighting over the last roll. Thank you, Jules. They are one of my family’s favorite recipes. Have you tried making these successfully without eggs??? Very allergic to eggs. I did today and they came out great! I used Bob’s red mill egg replacer. Is there no cheese in the recipe? Hi Shelia, Yes, that is correct. There is no cheese in this recipe. I have a daughter with a dairy intolerance (and know many friends who are in the same boat) so I adapted our favorite cheesy bread to be dairy free, without using store-bought vegan cheeses. It has the same texture, and similar taste as classic Brazilian Cheese Breads, but it is dairy free.